We believe in PERFECTING our skills. AP implements a multi-tier supervision system to ensure our children receive only the best quality teaching available. 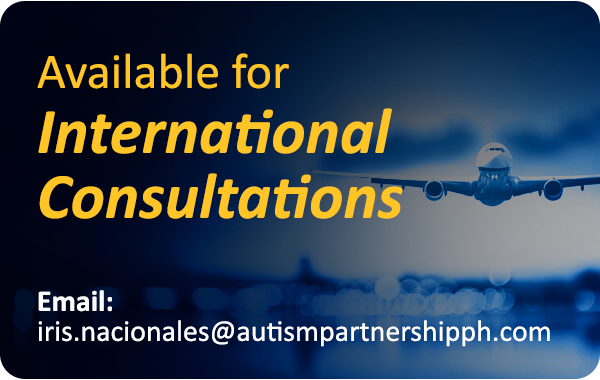 Our professional team of Behavioral Consultants maintain their current knowledge and high-level expertise through Autism Partnership’s commitment to ongoing training in Los Angeles. Training is conducted regularly in the Singapore, HongKong and USA. Our team of consultants are comprised of doctoral and master degree holders, clinical psychologist and Board Certified Behavior Analysts with an average of 10 years of experience in planning implementing ABA intensive Behavioral Treatment. Other than local families, they also consult to families and agencies in other countries. Mr.Raymond Fung is a Board Certified Behavior Analyst (BCBA) with a Master of Science in Applied Behavior Analysis from St. Cloud State University, and a doctoral candidate at University of Bristol in education. After he graduated from the University of Hong Kong in 2000, he started teaching individuals with ASD of different ages and functioning levels in 1 on 1, group and school settings at Autism Partnership. Since 2004, he has been specializing in professional training for therapists, supervisors, schoolteachers, and parents internationally. He consults in China, Singapore, Japan, Malaysia, and South Africa. Since 2011, he has been consulting families in Manila, providing training to therapists and helping students to intergrate to schools. 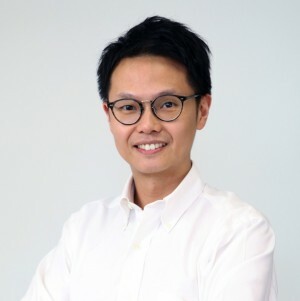 Currently he is the behavioral consultant of AP Hong Kong, the clinical director of AP Philippines, the conference chair of Hong Kong Association for Behaivor Analysis and the member of Association for Behaivor Analysis International. Raymond has been receiving on-going training from Dr. Ron Leaf and his associates. In 2014-15, Raymond has developed 6 mobile applications specially designed for individuals with ASD. Our Therapists are the frontline staff and they play a key role in the success of our agency. 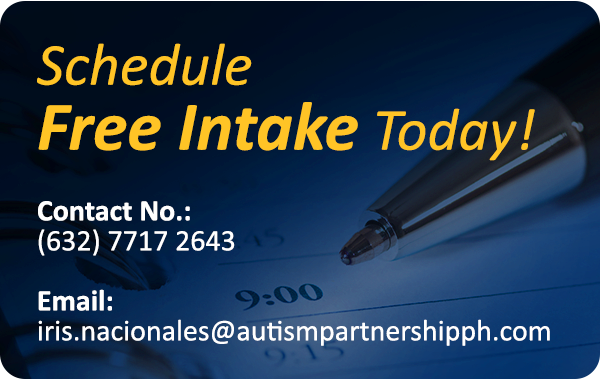 They work with our families and children in one-on-one, group and school settings to carry out program goals as identified by our Supervisors and Consultants. All our Therapists have at least a bachelor degree; some of them have masters degree from local or overseas universities. They have gone through a minimum of 400 hours of training in the first year and receive intensive and ongoing training for about 200 hours every year thereafter by local and overseas experts in the field. Our Therapists are highly skilled and experienced, and receive extensive support and training to perform their duties with passion, expertise and confidence. All new hires are required to complete 180 hours of pre-service orientation and training on implementing Applied Behavior Analysis with students with ASD. Training and orientation are in the form of lectures, case studies, role-play, case observations, and practical hands-on sessions closely monitored by our Consultants. All Therapists are required to attend monthly training sessions to further their knowledge and enhance skills. On-the-job trainings are both didactic and practical, consisting of lectures, case studies, videos, evaluations, and role-play. Our Asst. Director, Mr. Toby Mountjoy provides the quarterly training at our office, while our director Dr. Ron Leaf from US Head Office visits Singapore annually to provide direct training to staff. 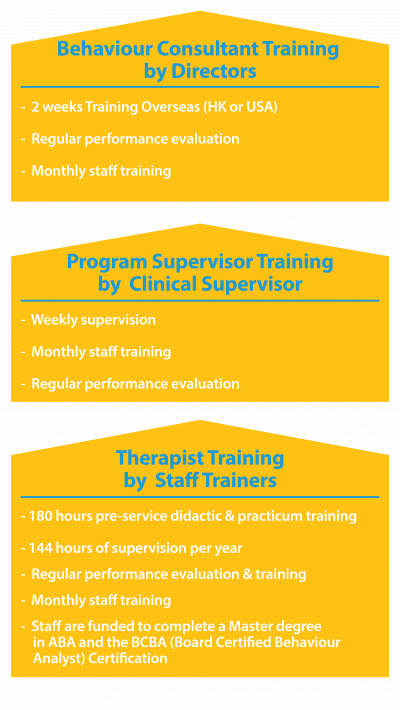 Our Therapists receive over 400 hours of induction training and 1:1 supervision by our Supervisors and Consultants in their first year on the job. Thereafter, staff continue to receive over 200 hours of supervision per year with weekly supervisions, regular clinics and team meetings specific to the child they are working with. Weekly supervisions allow us to monitor and evaluate the quality of our services, and track progress of our students. Our Therapists are formally evaluated through supervision and review meetings with our Site Director on an ongoing basis. Evaluations are based on Therapists’ practical skills, programming skills, work attitude, communication skills, organization skills as well as professionalism and leadership skills.